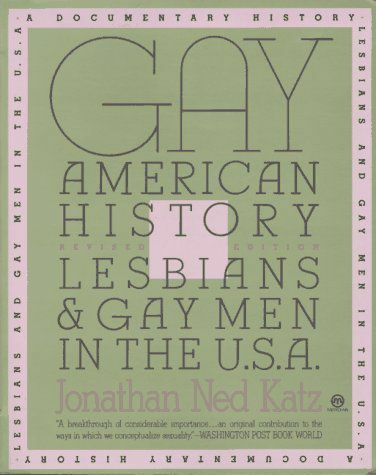 We are delighted to announce a conference marking the fortieth anniversary of Jonathan Ned Katz’s Gay American History: Lesbians and Gay Men in the U.S.A. (New York: Meridian, 1976). This conference on the anniversary of Gay American History will provide an opportunity for critical reflection on the book and on the international development of LGBTQ and heterosexual history. We will highlight the ways in which theories, categories, research methods and priorities have been constructed, challenged, and reconstructed over the last forty years of historical research on sexuality and gender. GAH developed out of Katz’s documentary play, Coming Out!, produced by New York’s Gay Activists Alliance in June 1972. The book, intended for general readers and as an incitement to scholarly research, spoke to two audiences. This conference will also speak to the general public as well as to researchers, featuring scholarly presentations along with visual art and performances inspired by LGBTQ and heterosexual history. As a founding text of LGBTQ history, GAH appeared before the modern institutionalization of such studies, when such research was actively discouraged in universities, and it was not clear that such scholarship had any future. Drawing together an unprecedented collection of documents produced since 1566, GAH anticipated and inspired many aspects of the LGBTQ history research that followed. This anniversary provides an opportunity for reflecting on earlier work on sexual and gender history and the growth of the field since 1976. Because GAH was produced by an independent scholar, the legacy of the book also invites questions about the economics of such knowledge production, and the present situation of independent and other scholars in the fields of sexual and gender history. Keynote speakers for the conference include Susan Stryker, with more invited speakers to be announced. To propose a paper, please submit a 250-word proposal plus a brief bio for each person involved, including contact details. Please indicate if your proposal is a conventional conference paper or a different type of contribution (e.g. performance, exhibition etc.). Please send your proposal to daniel.marshall@deakin.edu.au by August 31 2015. · Sexual and gender histories beyond the U.S.
We strongly encourage contributions from a wide range of disciplinary perspectives, and t is anticipated that the conference will produce an edited collection. Hi. This looks great, and I’m considering submitting a proposal. I wonder though, why there are not “contributions desired” for Lesbian History or for Gay History. I suppose that you might think these are the *obvious* categories and would seem redundant, but I would ask that you place them into the list if you do want submissions in these categories. I take nothing for granted these days. Hi, Is there any more information about the conference? All that I’ve been able to find is on this page. Thanks.